The apartment is about 55m * large, ideal for 2 adults and consists of a bedroom (located to the back, so quiet ...), a bathroom with a shower and a large kitchen, from which the 30m * large roof terrace goes off - here You can enjoy a wonderful 270 * view: From the mountains of Tenerife in the east over the beach, fishing port and Atlantic to La Gomera and La Palma in the northwest, where the sun sinks into the Atlantic. The functional kitchen is equipped with a fridge / freezer, 4-ring ceramic hob, oven, coffee maker, microwave, toaster ... so perfect for self-catering. In the living area is a large sofa, 2 armchairs and next to the radio, you can of course also receive German television. On your roof terrace with a large awning are table, 4 chairs, 2 chairs and a washing machine and a clothes horse - in the bedroom we also ironing board and iron accommodated ... but actually you have holidays! Have fun! The bright tiled bathroom has a skylight, so in addition to 2 lights and daylight brightens the room. Families with small children are welcome - we are happy to provide a travel cot and a high chair available - please inquire beforehand if it is still available at the desired time! Please note that the apartment is located on the 3rd floor - dream view and no neighbors, which guarantees a 'trampling on the head'. But there is no lift ... If you have special requests regarding equipment or similar, please ask: What's up, we like to do! If you do not take a rental car, we will of course be happy to take care of your airport transfer so that you have a vacation right from the start! An amazing apartment! There was everything we needed for a great holiday. The terrace was the icing on the cake. We spent a lot of time looking out at the port and the sea watching what was going on! There were 68 steps up to the apartment, and we climbed them 3 or 4 times a day, but it was a good exercise for our legs! Ann, our host was really good and efficient with the booking, when we arrived and when we had a problem with the tv and the keys. 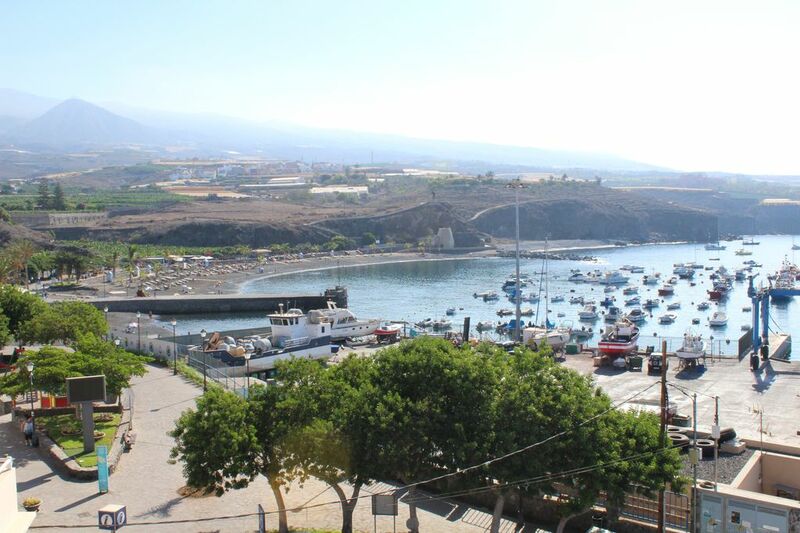 If we return to Tenerife, it will just have to be to this fantastic apartment! Playa San Juan is a small, idyllic fishing village, located in the sun-soaked southwest of the island. Due to the fact that no hotels have been created here, the place has retained its original flair. So nice a trip z. b. to Teide National Park - in Playa San Juan you can spend a dream vacation without a rental car! In the morning take a stroll to the harbor, see what the fishermen have caught, then to the large, sheltered sandy beach to relax under the palm trees and in the late afternoon, when the sun slowly dips the mountains in a soft light, the beach day comfortably. At the latest when you enjoy the sunset behind the neighboring island of La Gomera with a refreshing aperitif in your hand, the right holiday feeling will set in! Whether you want to be pampered on holiday or finally have time to cook at home for two: Supermarkets and bakeries are just as good as good restaurants and nice bars!